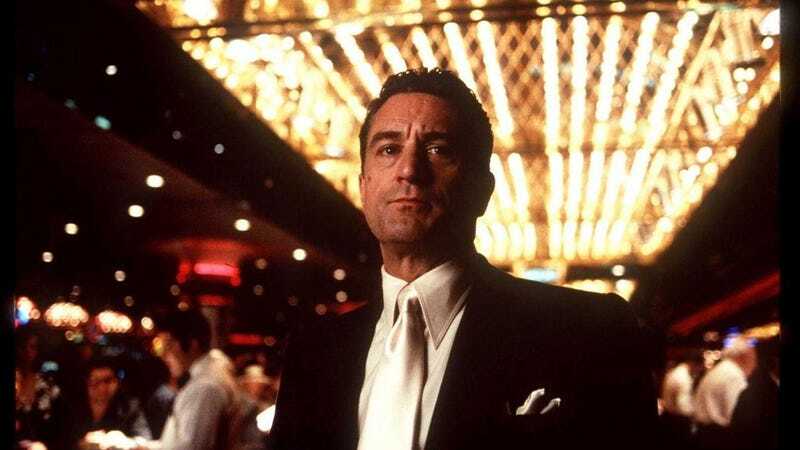 Last week, I rewatched Casino, Martin Scorsese’s 178-minute glitz epic about the rise and fall of the mob in Las Vegas in the 1970s and ’80s—a movie that wrestles with its own conspicuous excess. The needle-drop montages, the zillion costume changes and killer suit-shirt-and-tie combos, the physical and verbal violence that makes up roughly three-quarters of the scenes. Scorsese’s interest in machismo has usually been chalked up to runtishness and childhood asthma, growing up as an indoor kid in the post-war Bronx; regardless, his characters are often outsiders with an insider’s take. That’s true of Goodfellas’ Henry Hill, a vicarious gangster with too much Irish in him to ever become a made man, and of Casino’s protagonist, the Jewish bookie Ace Rothstein (Robert De Niro). But also of the characters Leonardo DiCaprio plays in The Departed and The Aviator, both also recently revisited in a minor Scorsese kick. And, obviously, Gangs Of New York. In a body of work that’s as weighed down with Catholic influence as Scorsese’s, the ultimate “not one of the guys” story would be the New Testament. Hence those two subversions of the ’50s historical epics of his childhood, the awe of church and Cinemascope: The Last Temptation Of Christ, in which the blond and blue-eyed Jesus of Catholic kitsch wrestles with human needs, and the underappreciated Silence, in which an emaciated Jesuit wonders what it would take to be Christ. The other possibly autobiographical thing about Scorsese’s characters is that they are mostly lookers: the zonked, insomniac eyes of Travis Bickle; the look Charlie throws Johnny Boy when he struts into the bar in slow-mo to “Jumpin’ Jack Flash”; the young Henry Hill’s green contact lenses watching the street through the blinds. It’s where the influence of Alfred Hitchcock on Scorsese’s work is most prominent: the importance of eyelines. But Casino is a different case; its signature point-of-view shot is of snorted cocaine from the perspective of the straw. And that’s Ace Rothstein in a nutshell: the straw for the film’s own addictions. He’s a keeper of secrets who runs the Tangiers Casino on behalf of the old-timers of the Chicago Outfit. (The lawyers at MCA/Universal Pictures famously insisted that neither the mob nor the city of Chicago ever be named, probably because of the company’s old Outfit ties; its multimedia empire had started in the Second City back in the 1920s, on the jazz booking circuit of the Al Capone organization, and its mob associations continued for decades.) He’s something of a mystery; the two well-known shots in the film that emphasize his gaze hide it behind tinted glass. In Casino’s play on Gatsby-esque reinvention and longing, he is both Jay Gatsby and the eyes of the T.J. Eckleburg billboard, a dead stare out at the wasteland. The first of these shots comes around the middle, as an approaching car is hauntingly reflected across Ace’s Ultra Goliaths. The scene is the most Sergio Leone-esque in the film, which, in a twisted way, offers Scorsese’s take on the Western: greed and elemental conflict in a moral desert, Vegas as the Wild West of gangsterdom. (Casino even features a few Nevada cowboys, and a scene where the casino manager, played by Don Rickles, shows up at Ace’s house with a shotgun to defend it like a frontier homestead.) But the real mystery is the final shot of the film, of a gray-haired Ace in thick prescription lenses; his eyes look beady behind the glass. Scorsese has a habit of ending his films by trapping his protagonists in a mirror or by posing them with a reflection. But Ace is a consummate gambler and handicapper; in the end, his eyes don’t give away a thing.